At long last, High 5 Pie has opened its retail operation in Seattle, on 12th and Madison. Which, not that you asked, but is right along my usual route from home to the store each day. You know what that means: CakeSpy's gonna be high on pie forever! 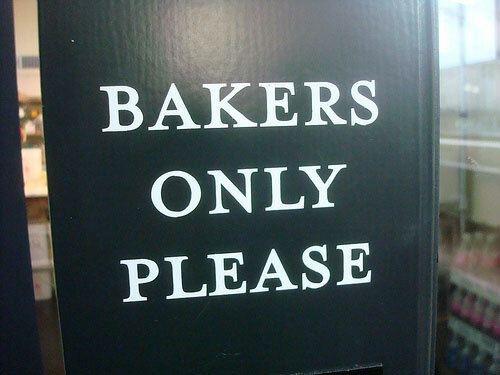 Now, I was pretty primed to love this bakery. After all, I've been a big fan of their pies (previously primarily found at owner Dani Cone's Fuel Coffee locations) for a long time. Aaaand (full disclosure) I was a consultant for some recipes on their menu, which has expanded with the new retail operation (fun game: to to the bakery, and guess which flavors I helped develop). High 5! But upon visiting on New Year's Day with Mr. Spy--our first official bakery visit of the year!--we were even more impressed than we expected. The pies are delicious. They come by the slice, in mini pie form, in hand pie ("Flipside") form, or as pie fries! And since they sneak crack into the pie crust, you bet your bottom dollar it's good. They serve them a la mode, if you'd like, with Bluebird Ice Cream. The space itself is beautiful, with a slightly more minty green version of Tiffany blue used all over the place--on the custom espresso machine, on the signage, you name it. But of course, they still maintain some secrets. ...and they have this t-shirt. BUTTER! LOVE! Now, here's the thing. I bought this t-shirt, in Unisex Small, but as it turns out, your dear Spy is smaller than small, and it doesn't quite fit. This is good news for you though, because I'm doing a giveaway! Even if unisex small isn't your size, I'm sure you can find a willing recipient for this BUTTER LOVE tee. Want to enter? Simply leave a comment below, telling me what flavor of pie you favor best. The giveaway will close on Thursday, January 13, at noon PST; one winner will be chosen at random. US and Canadian entrants only, please. For immediate pie gratification, visit high5pie.com. We have a winner! Kase was chosen at random, and her thoughts on pie are: "i love love LOVE anything citrus, so it's gotta be key lime or lemon meringue tied for favorite. That said, I do enjoy baking any pie that involves booze, wink wink."